Oysters – did you know they take 3 – 4 years to grow. We didn’t until we visited Lindisfarne oyster farm in Northumberland. The reason for this visit was after numerous of lunches at Wright Brothers in Borough market where we would devour half a dozen oysters and a glass of Chablis we realised we didn’t know anything about them. Since the sudden change from being a child where the thought of an oyster was absolutely revolting, to it becoming an exciting and delicious delicacy we have always preferred Lindisfarne oysters, they are soft, creamy with a rounded flavour of the sea. So off we went on the three and a half hour train journey up to Northumberland to meet Chris Sutherland. Lindisfarne oyster farm is situated just off Holy Island, it is incredibly beautiful, very peaceful and very nippy with a sharp wind coming off the North Sea. After a bumpy ride in the Land Rover we arrived at the beds, rows and rows of mesh baskets that are the homes to the growing oysters. They are totally organic and feed from the cool waters that wash over the beds daily. Once they have grown till their required size they are plucked out and then into a 42 hour purification process to clean out any nasties, they are then packed into chilled boxes and head off to the restaurants or in this case the Wright Brothers. Oysters are reputed to be a favourite of the famous lover Casanova, so we had to ask Chris.. are oysters really an aphrodisiac “Oh yes!” he says, apparently the week before Christmas and Valentines Day are his peak times. These are a perfect starter or canapé for a pre Christmas party. 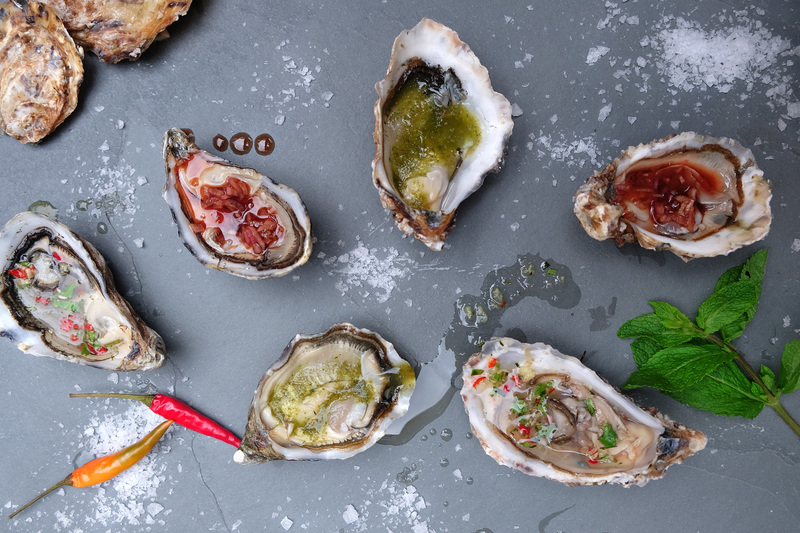 We wouldn’t argue with a simple squeeze of lemon and a dash of tobacco being the ideal seasoning to an oyster, but if you feel like being more adventurous these are our favourite recipes, and the angostura bitters one is our Christmas special . For the biggest impact we would serve them on crushed ice with the dressings on the side and leave it up to your guests to choose there own, they need to be served immediately.